Lets get the big hitter out of the way first. Filmed in 2013. Part 12 uploaded in 2012. am slow. After a long time, i got a new episode uploaded. unfortunately Fabiene’s replacement Bobby (check out his youtube channel) lives in Ireland so i doubt i`ll have part 14 up anytime soon. If i do however, I’m planning on reusing the character animations in the opening, but changing the background to fit the level. As you can see in this level, the animation ties in with the level. It was hella nostalgic coming back to this, I would seriously love to do more. I have some footage for the next level but we didn’t finish it. I’ll do some editing and see if its worthwhile uploading. Another animation. A base `nice and cripsy` animation for Jay. Where the boxart can be interchanged. Assume `nice and crispy` is his lingo for a preview. He hasnt used this in a video yet hence why I’m showing it off in GIF form. One more item on the dinner agenda. A small animated intro for his coverage of rogue legacy. basically a still image with some moving parts and flair. Quick and easy to make and looks fairly polished. Small post for now! Legend of Fail had been eating up most of my time. 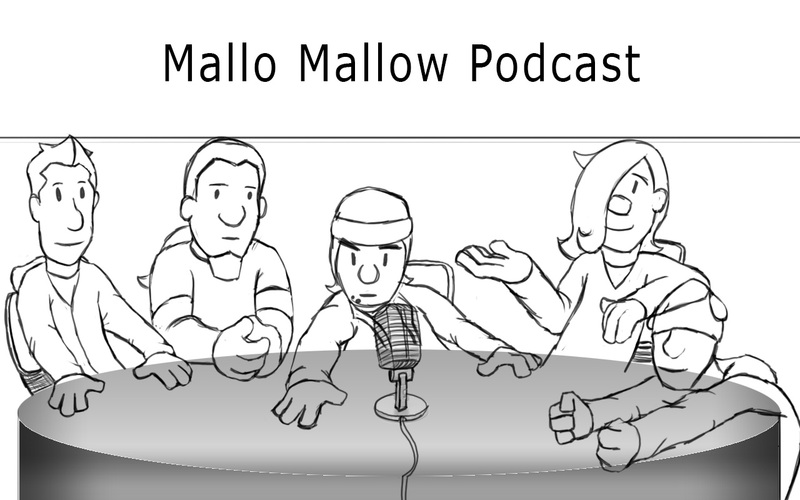 I’m doing more work for Mallo Mallow however. Working on a podcast animation for them. I’ll leave you with the preview of it thus far.